(Quick Effect): You can target 1 face-up monster you control; banish it until the End Phase of the next turn. You can only use this effect of “D.D. Seeker” once per turn. D.D. Seeker is a different take on the D.D. monsters. Same stats, different Attribute than D.D. Lady, but a quick effect that allows for flexible protection of any monster you’ve got, including itself. Able to save a monster from a battle or effect during either turn is a useful effect, even if you would lose Seeker before your monster would return in the End Phase. While it is a nice monster, it isn’t for every deck, and there are more direct cards that are used for protection of your boss monsters. The effect would be better if it could be any monster, rather than face-up, or if it could be any monster face-up on the field, not just your own side. Remember the D.D. archetype? Not the D/Ds, but the D.D.s. Yeah, I feel they were only good as tech cards like Warrior Lady, Assailant, and Warrior, which are ok cards though don’t stand the test of time very well. Today, we get to look at the newest D.D. card, Seeker. 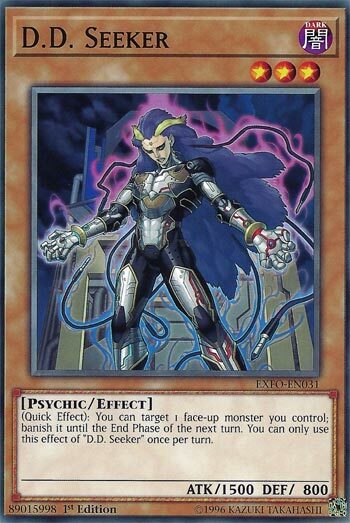 Seeker is a Level 3 Dark Psychic with 1500 ATK and 800 DEF. Stats are whatever for a Level 3. Being a Level 3 Psychic does give you Emergency Teleport, but that is currently limited. Attribute is nice. As a hard once per turn, and being a quick effect, you can target a monster you control and banish it until the End Phase of the next turn. Nice little Wind-Up Rabbit effect for any monster, though I don’t know how many decks would want to make use of this. Maybe some sort of stun decks. I can see somewhat of a use for this, maybe in that old Chain Beat deck that loved running Wind-Up Rabbit and Evilswarm Thunderbird. Other than that, I can’t think of a good use for this. It is meh to be honest, but all of the D.D.s are like that in 2018. D.D. Seeker is our midweek card. Dark, level 3, Psychic, 1500 attack (800 defense) not much of that really jumps out at you, but it does mean it can combo with Emergency Teleport if need be. In true form to most D.D. cards, the effect here involves removing something from play. As a Quick effect, once a turn you can Target and remove from play one face-up Monster you control. Said Monster returns at the End Phase of the next turn, and this is a once a turn effect. Honestly, I don’t see much good for this. I guess it could be a stall of sorts while you’re waiting and hoping to Draw into something you need and have a Monster you really need to protect. But overall, this card sits in the meh pile.